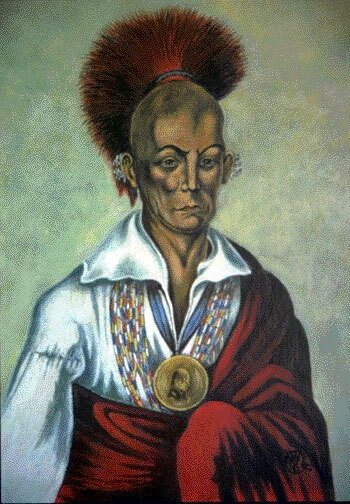 Makataimeshekiakiak, or Black Sparrow Hawk, was born in 1767 in the Sauk village on the Rock River near the present Rock Island, Illinois. Throughout his earlier years, he resented Americans as dispossessors of the Spanish, with whom his people had traded since 1769. Then, in the War of 1812, he took action, aiding the British and attempting to rally tribes against the Americans to halt the westward expansion. However, American rule prevailed and Black Hawk's own tribe was made to move from Illinois to lands in Iowa. In 1832, he led his people back to Illinois, hoping to reclaim some of their former land. However, Gov. Henry Atkinson summoned federal troops and a conflict ensued. The Indian leader bravely led the Sauk and Fox Indians in this so-called Black Hawk War; but aid from other tribes was not forthcoming, and the Indians were unable to resist. Although he was captured and imprisoned, in 1833 Black Hawk was taken by the government on a tour of eastern cities, and presented at the White House to President Jackson. He dictated an autobiography in defense of his actions as a war leader in that same year; and then finally, in 1837, gained his freedom. He died a year later, on October 3, 1838.